Lately I've been thinking a lot about breakfast. And that's pretty unusual for me since it's never been a meal I gave much thought to. It always seems like, no matter how early I get up, I have so much to do before the day "officially" starts and I'm always running behind. So breakfast ends up being a bowl of cold cereal. And I'll admit that I've been known to skip the milk and just eat the cereal bits like little snack bites in between other morning chores. So not inspiring. Traditional breakfast foods like eggs, pancakes, French toast, etc. are all really great dinner food as far as I'm concerned but I just can't face them in the morning. And I like my sweets as dessert, not breakfast. I can face bread, though, if it's warm and fresh and buttery. So I've started to take a Sunday morning break from the cereal and treat myself to a hot cup of tea and a slice of buttery toast. Of course, baking bread from scratch is not a quick breakfast task. But baking this quick bread version definitely is. 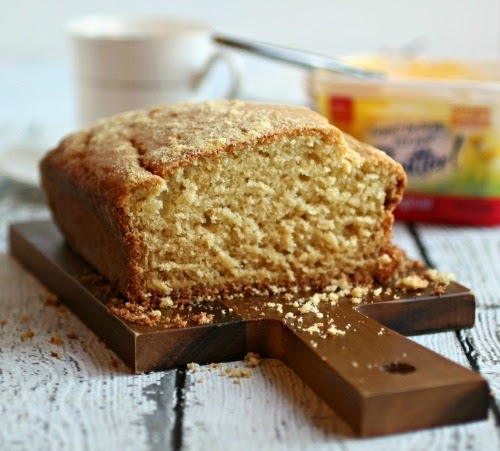 I added a touch of cornmeal for texture and a bit of sugar for a barely there hint of sweetness. Best of all is that I used the new recipe version of I Can't Believe It's Not Butter. It's made with plant-based oils, no trans fats, no cholesterol and no partially hydrogenated vegetable oils. 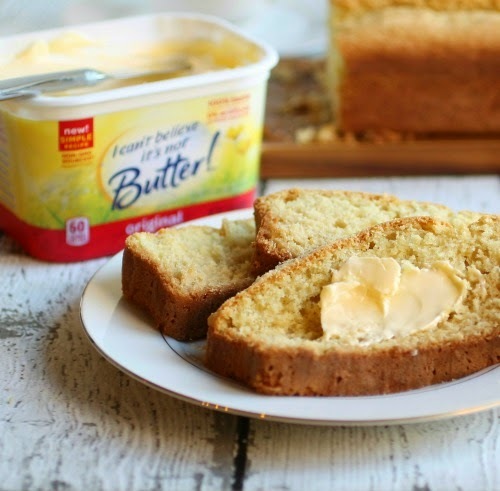 It's great to bake with, has all the buttery taste I wanted but with 40% less calories and 70% less saturated fat than regular butter. And that totally means I can have two slices. Cereal? What cereal? Enjoy! In a large bowl, cream together the eggs, sugar and I Can't Believe It's Not Butter spread. Beat in the buttermilk. In a separate bowl, sift together the flour, 1/4 cup of cornmeal, baking powder, baking soda and salt. Beat the dry ingredients into the wet until combined. 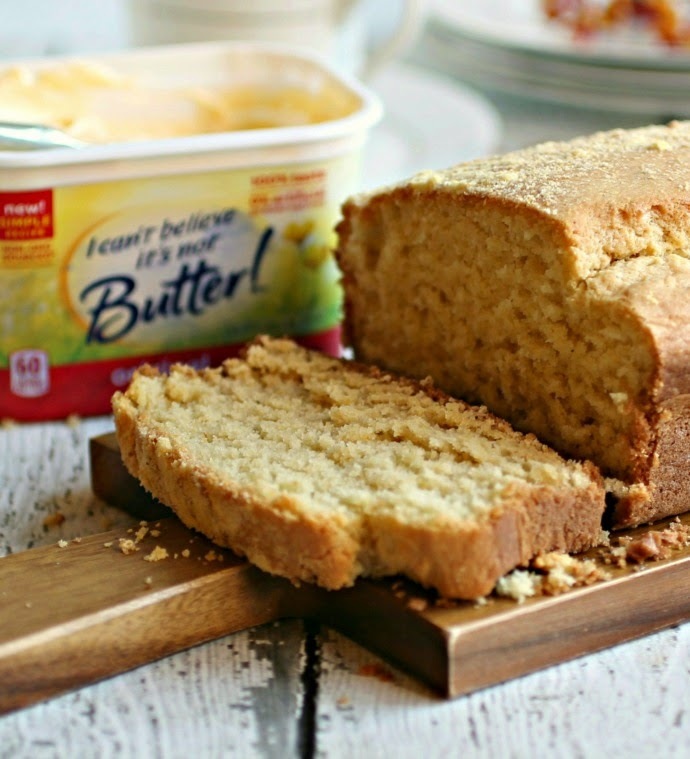 Butter a loaf pan (I also insert a sheet of parchment paper for easy removal) and pour in the batter. Sprinkle the remaining tablespoon of cornmeal over the top. Bake for 45 - 50 minutes or until the bread is a light golden brown and a toothpick comes out clean. Yep, I'd say goodbye to cereal and hello this this bread too. Yum! Oh, and it happens to be National Homemade Bread Day too. So glad to see you joining in the celebration! 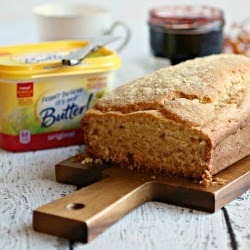 mmmm I love this quick bread! Perfect for breakfast! This looks perfect for Thanksgiving morning.